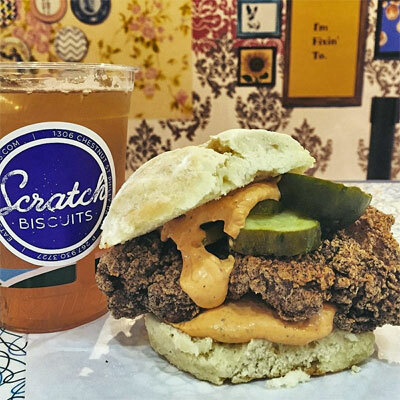 By Arthur Etchells·	 10/28/2015, 11:31 a.m.
Scratch Biscuit is now offering its late-night $5 Buck Cluck special as a happy hour special as well. The $5 Buck Cluck is fried chicken, pimento cheese and pickles on a biscuit and it is now $5 between 3 pm and 5 pm. Previously the $5 Buck Cluck was sold late-night out of the back door of Scratch on Drury Street. At happy hour, you can stroll right in the front entrance at 1306 Chestnut Street.